I am so glad my first beer review for FYM is Dogfish Head 90-minute. Not only is there a lot to talk about, but it's probably my favorite beer of all time (FYM AGREES), so lets just start with the facts. So what does this all mean? 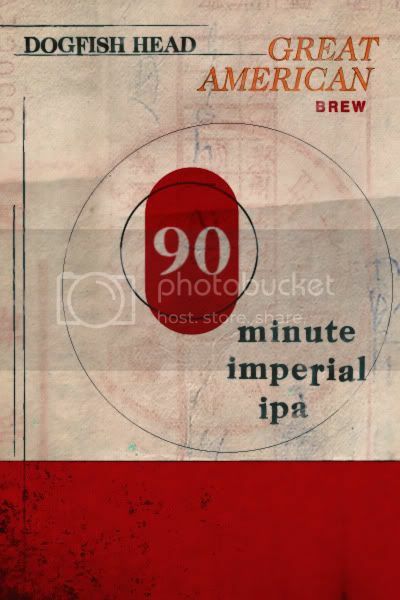 90-minute is a continuously hopped Imperial IPA, meaning that for a whole 90 minutes the wort is boiling hops continuously, and then dry hopped after cooling to ensure a flavor that is not too bitter. It has a deep amber color to it (I'm guessing about 8-10 SRM). If you drink it out of a snifter (preferred) you can smell the fusion of hops + malt and REALLY appreciate the work that went into this particular IPA. The flavor is something that I feel truly sets the 90 apart from other Imp IPAs that I have tasted and brewed. The flavor hits you all at once and is gone a second later (and they're usually quite bitter). Because of the continuous hop additions, and the perfect hop to malt ratio, the 90-Minute flavor tastes the same from beginning to end. A very smooth yet strong hoppiness balanced perfectly by the presence of lots of malt a perfect mixture of bitterness, flavor, and aroma. At almost $12.00 for a 4 pack the prices are steep but it is worth it (higher alcohol content too)! Give this beer a shot! We guarantee, you will not be disappointed. 90-minute is the perfect end to the work day. Drink one, or in my case two. Regardless, pick up a couple four-packs, and enjoy the Best Brew in America with friends.